For our Christmas present this year, my mother very generously offered to take us on holiday, that is, myself, my wife, our baby son and also my sister. We were looking at cheap package holidays, and we didn't really mind where exactly. We had some stipulations: we had to fly from Norwich, our local airport (last year's holiday to Tenerife was tempered by a late arrival into Luton at 1am followed by a 2 hour drive home, all with a 10 month old). Flights had to be at a reasonable hour of the day, and we would prefer self-catering, with 2 separate apartments, so our boy (I really should stop calling him "baby" now as it is his 2nd birthday tomorrow) wouldn't be disturbed while having his daytime sleeps. This narrowed it down to the 3 Balearic islands, Ibiza, Majorca and Menorca, of which each has 1 flight per week from Norwich (except Majorca, which has 2). My sister chose Ibiza. We didn't know what to expect, as the island has a reputation as a young people's clubbing and nightlife paradise. We eventually found a package through Thomson (part of Tui) that included flights, self catering villas (yes, villas, plural) and a rental car, for a very good price (£1700). Interestingly, I originally searched as 2 apartments, and we were allocated 2x 4 bedroomed villas, which we had and were very nice, spactious - on making a dummy booking on our return, the price would have been the same for 1 villa for the same number of guests. We were also advised that the rental car would be the smallest, class A, so we rented a 2nd vehicle for my sister to drive. Departure day. Our flight was at 14.55, so we booked a 7 seater taxi to take us the 10 minutes to the airport, my sister bringing my mother to our house and leaving her car there. 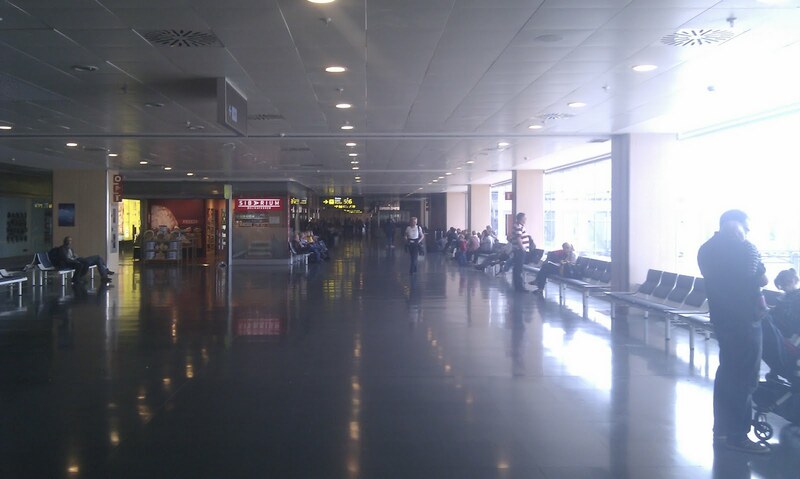 We entered the small terminal building and checked in, with almost noone else there. We received our seats, checked in our luggage (20kg per adult, 10kg for the infant, all of which was taken up by a car seat for the rental car), and moved away. 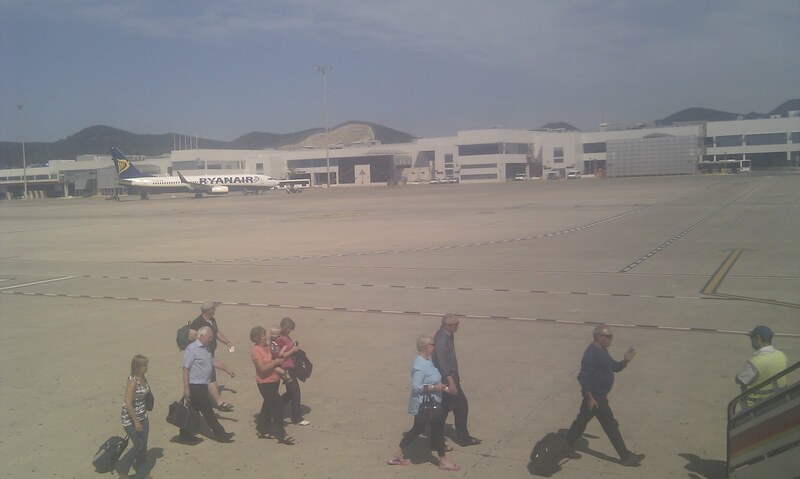 By now there was a sizeable queue behind us - everyone arriving at exactly 2 hours prior to departure. The car seat had to be taken to the "oversize checkin / staff" security area, where it was x-rayed and taken for loading. We had to buy "Airport Development Fee" tickets to continue to security. I have no problem with this fee, only that it is collected at the airport - why cannot it be added to the air tickets with the other airport fees?! After passing security we found seats near the assigned gate. View of the aircraft on stand. 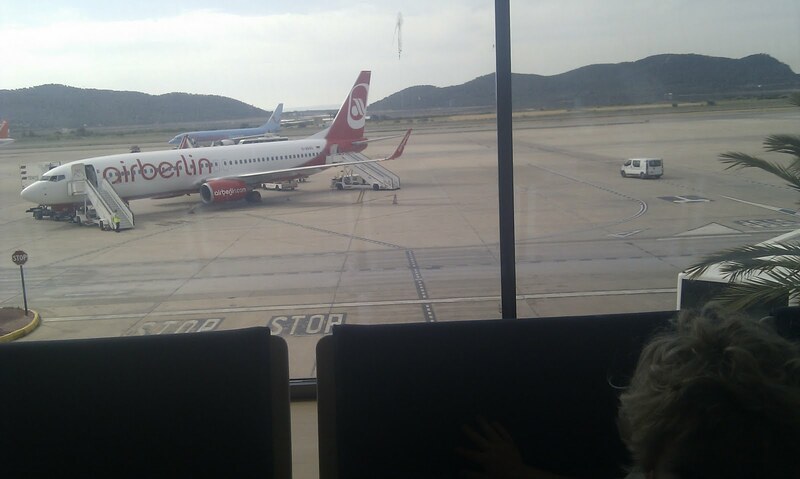 We bought some drinks from the cafe, and had a look round the small departure lounge - we didn't buy anything else. Matthew had a wander round, with me following closely, to make sure he didn't "play" with any of the cables coming from the gate desks. He watched with fasinaction the aircraft on the apron - our 737, and a pair of Eastern Airways aircraft (a J41 and a Saab 2000). He also watched the various trucks buzzing round. 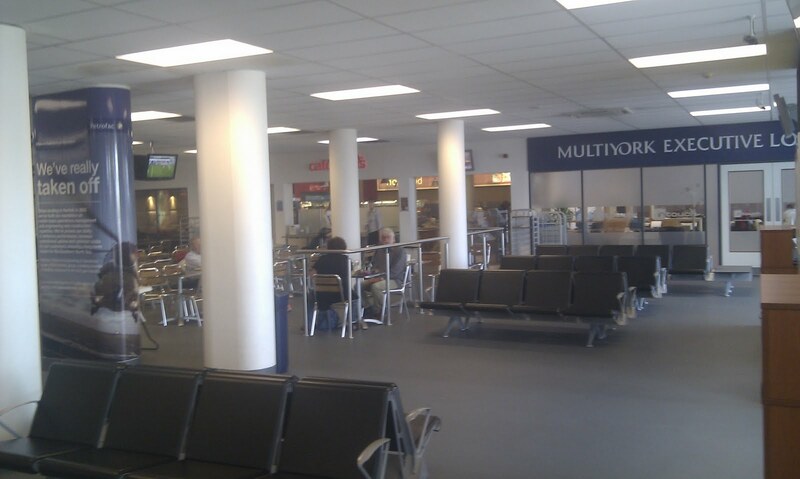 Departure lounge, with the business lounge visible. All 4 gates (read, doors to the apron) are to the right). FIDS. Note helicopter flights to offshore gas platforms. 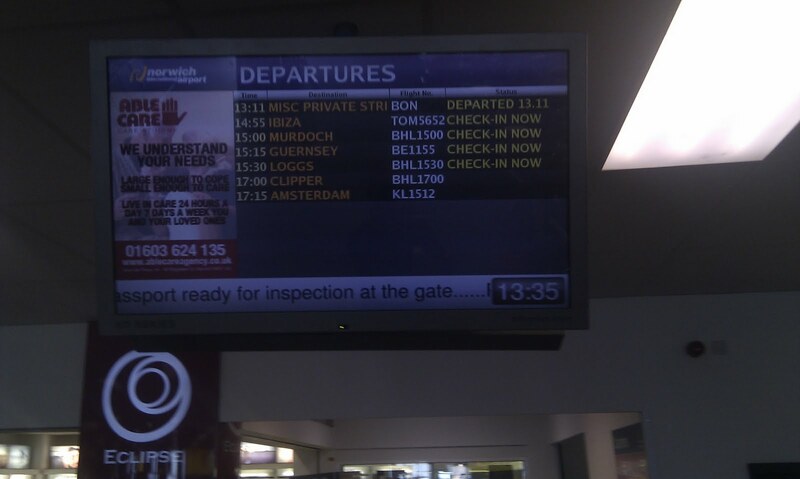 It was soon time to board. There was no priority boarding for families or others requiring assistance, probably as there were so many people with young children travelling, 8 or 9 easily. Boarding was by row, back half first, so we waited our turn. After some time, al rows were called forward. 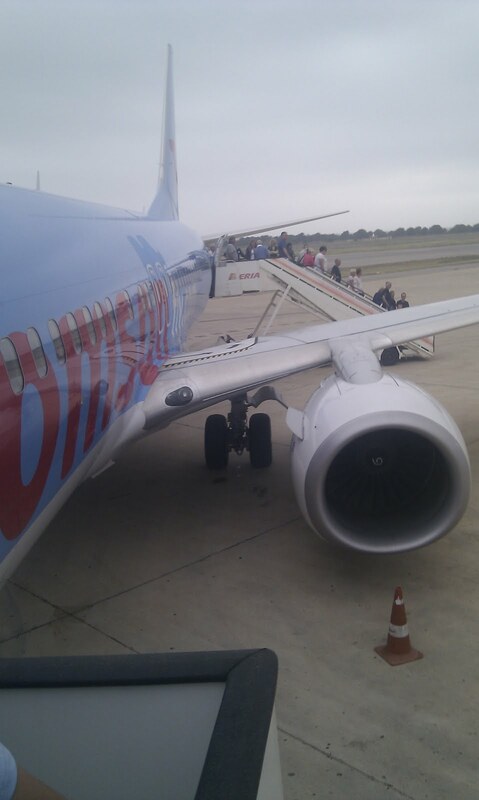 We walked accross the tarmac (concrete actually) to the aircraft. We left the folding pushchair at the bottom of the steps and boarded. We packed our things in the overhead locker, got out some toys and snacks for Matthew, and waited for boardingto be complete. The load, according to the checkin agent, was 100%, and indeed every seat was taken. We were ready to depart 20 mins before scheduled, but the captain came on the tannoy to announce a delay until the proper departure time due to ATC restrictions accross France. During this time the safety video was shown. This was amusing as it was acted out by children, though I can imagine the crew getting tired of it quite quickly! Eventually we pushed back, and taxied onto the runway. We backtracked to the end of runway 09, and took off with a great burst of acceleration, as the NWI runway is relatively short. We passed through the clouds, and turned south, following a routing following roughly the A11 road to London, where we headed south over Paris, and down to Barcelona. 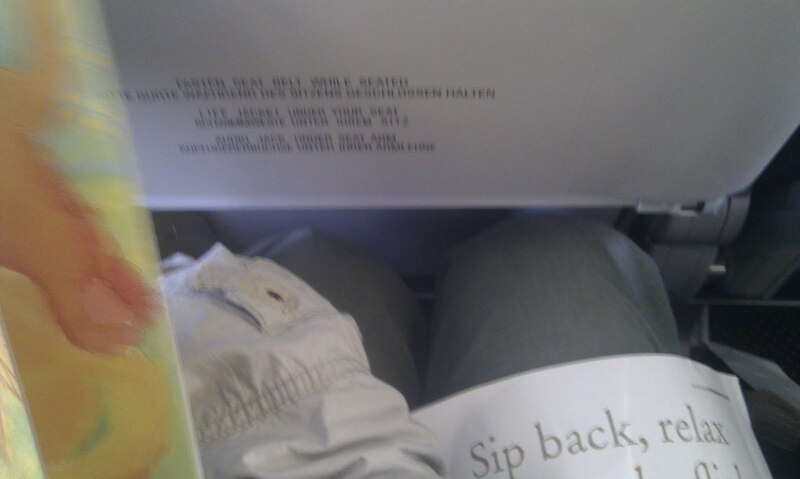 The obligatory legroom shot. There was not much. An announcement was made by the cabin crew that the first service would be the BOB round, followed later by the hot meals service that people had pre-booked. As we had booked meals, we let the cart pass. When our meals came, my wife's Gluten Free meal had not been loaded. I double checked the paper ticket "book" that Thomson supply, and the specific meal was not listed there either. Damn, I should have noted it when it arrived. I had definitely booked the GF meal, as it was on the original email confirmation (which I didn't have with me, thinking the ticket book would suffice). Still, they gave my wife some drinks and crisps from the BOB cart that she could eat. Incidently, the meal consisted of chicken pieces in a tomato sauce, with mashed potatoes and runner beans. As a side, there was a roll and butter, a cup of water and a small lime cheesecake. Eventually we were approaching Ibiza. We circled the island , approaching from the Mallorca side, that we could see on approach, crossed the width of the island before turning and approaching to land on Runway 06. As we were on the left side, we saw all the hills, and bays, of the south coast, hiding under a low cloud. We landed smoothly and taxied to a remote stand close to the terminal building. 2 busses were waiting, and everyone disembarked in an orderly manner. As we had plenty of bags, toys and snacks to pack away, we got on the 2nd bus, after asking one of the ground staff about the pushchair - we were informed that it would be loaded onto the carousel with the luggage. A shame, after what happened in New York last month. As it happened, the immigration queue was fast and short, with no such problems, and we were waiting for the luggage to appear in no time. Eventually it did, including the pushchair and car seat, and we made our way to the exit. The week before we departed, I had a missed call on my phone, from a Spanish number. I tried to find out who it was, and a Spanish friend said the area code was for the Balearics, so I assumed it was Thomson. When they called back the next day, it was the rep, Debbie. She said she would meet us off the flight. When we exited the arrivals channel, true to her word there she was. She explained to us where the villas were, gave us a map and driving instructions, and took us to the Europcar desk where our car was arranged. The included Class A car was unavailable, they had all been rented out, so we were allocated a Class D vehicle, an Opel (Vauxhall) Meriva. Nice upgrade! All fees were included, but we opted to pay for top-up insurance, to reduce the excess from EUR700 to EUR35, for the cost of EUR7 per day. We had also rented a second car, from Holiday Autos, for my sister to drive, that was arranged from a different rental company (Crown Auriga). 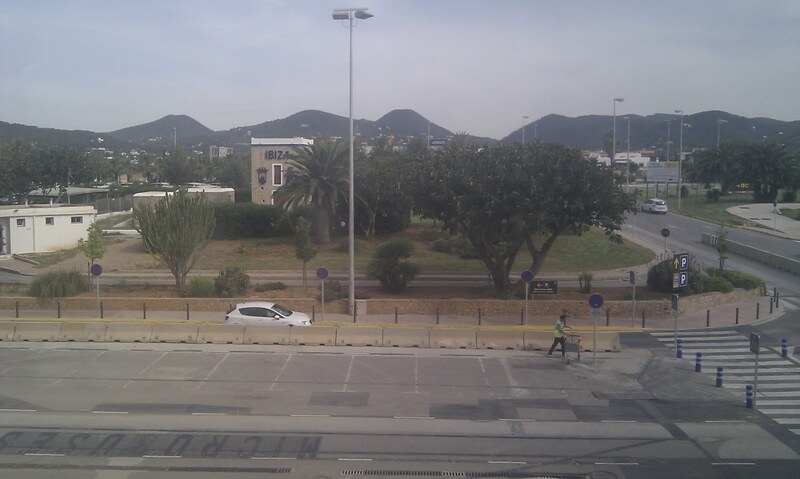 Both cars were in the multi-storey car park (on different levels) so we made our way there. We found our Meriva, and loaded up the car, and went to find my sister with her Corsa. One of the headlights was not working, so she set off to the terminal where the office was to explain and ask someone to replace the bulb. In the meantime, a staff member from yet another rental agency asked if we were ok. I managed, through a combination of pigeon Spanish and gesture, to explain that our car was fine, neither of us used his company, the light was not working, and the driver (my sister) had taken the key to the office. Phew! I'm still amazed that none of the 3 people present could speak a word of English in such a tourist-oriented location. In the meantime, Matthew started getting upset as it was past his dinner time, so we fed him whilst waiting for my sister to return. She came back with the keys to a different car, a Golf this time, with plenty of scratches and a large dent over the rear wheel arch, but it drove ok. This company had insisted on her buying a full tank of fuel in advance, for EUR70, whereas Europcar had filled our Meriva and told us to return it full. Eventually we headed out, on the right hand side of the road, to find the villas. Trust our luck that at this point it started raining, quite heavily. The weather forcasts had forseen this, and that it would clear up overnight, which it then did. We arrived at the villas and took the keys from the reception / bar restaurant at the front of the complex. We were shown to our villas, almost the furthest 2 from the bar and road, and therefore the quietest (not that it was loud anyway!) Each villa was almost the same, 4 bedrooms, 2 bathrooms, a kitchen diner and lounge with satellite TV, and a small private pool. 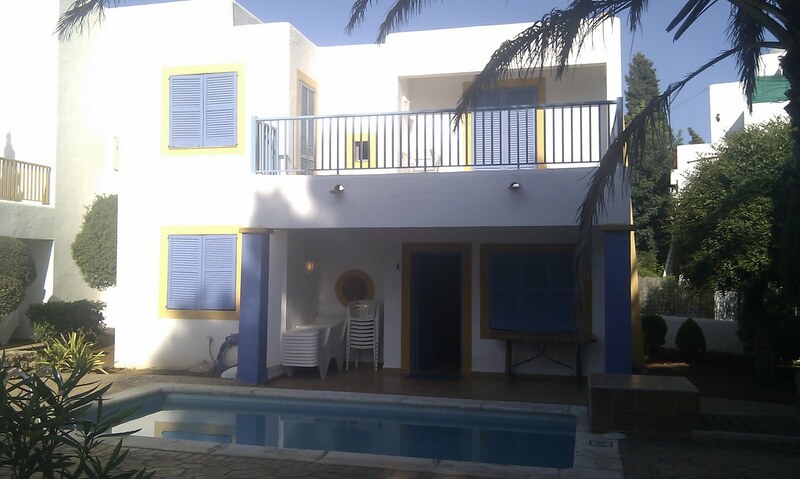 We were informed that the villas would be cleaned twice during the week, and the pool was cleaned each morning. 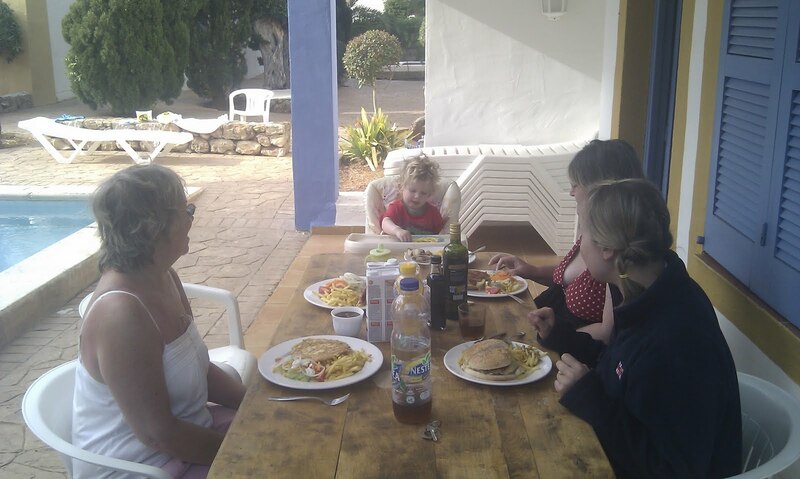 We settled in, bathed Matthew and put him to bed in the supplied cot, and bought take-away food from the bar to eat in the villa. We spent a lovely week relaxing, there was a beach about 200m away where Matthew had fun paddling, we went to the nearby "Hippy Market", and also drove around the island to some of the other nearby coves and beaches. We were somewhat limited in time as Matthew gets upset if he doesn't get his midday sleep, so on some occasions my mother and sister went out without us, and vice versa. 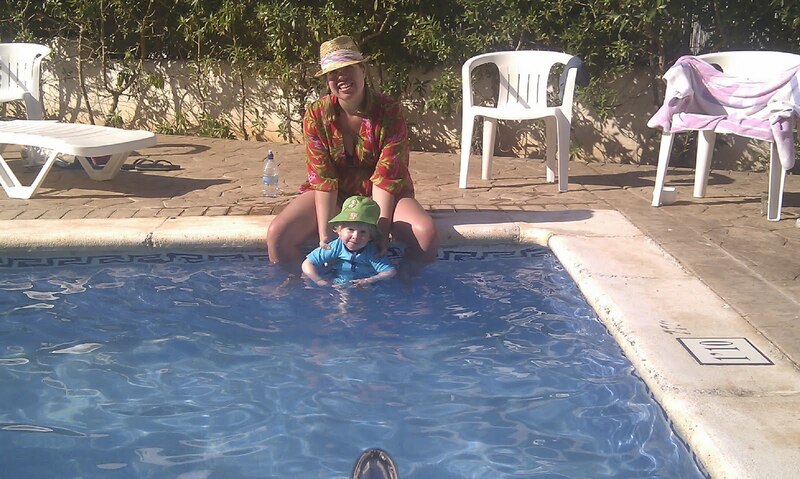 My sister and Matthew in the pool. 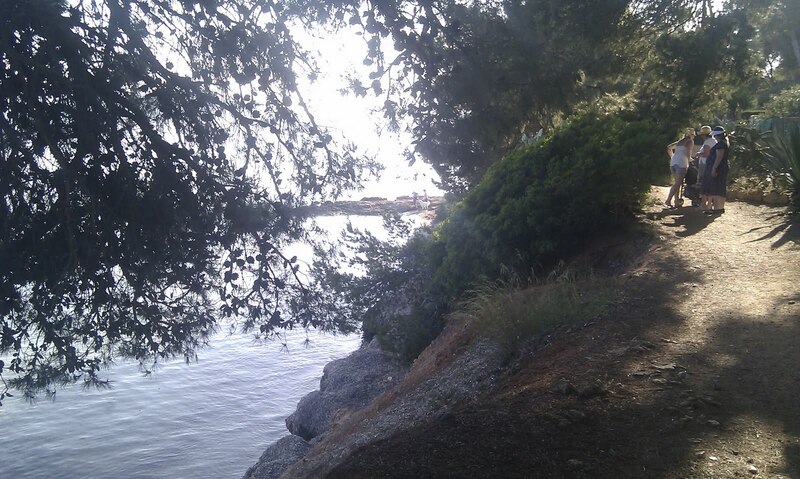 The path to the beach, partly along a small cliff. 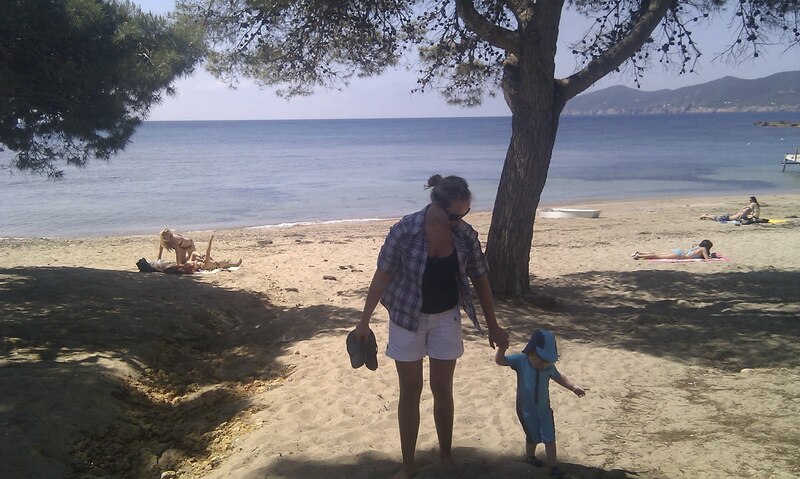 My sister and Matthew walking back from the beach, Cala Pada. 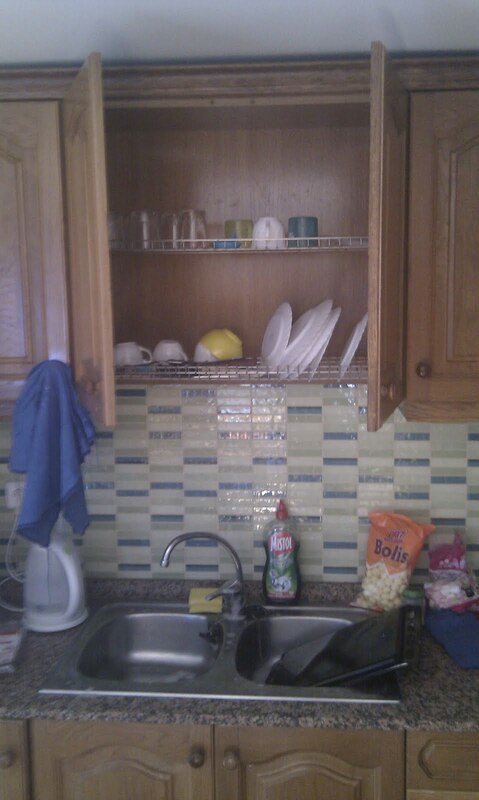 Kitchen draining board inside the cupboard above the sink. I like this idea. 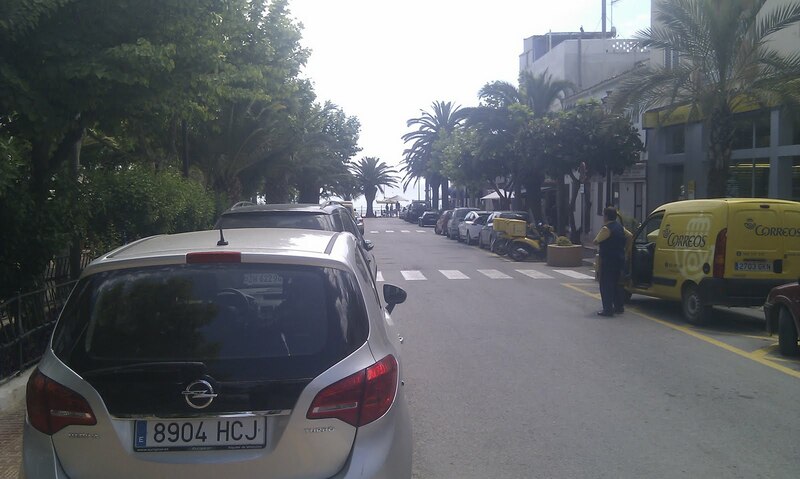 In the nearby town of Santa Eularia des Riu, with our rental car. 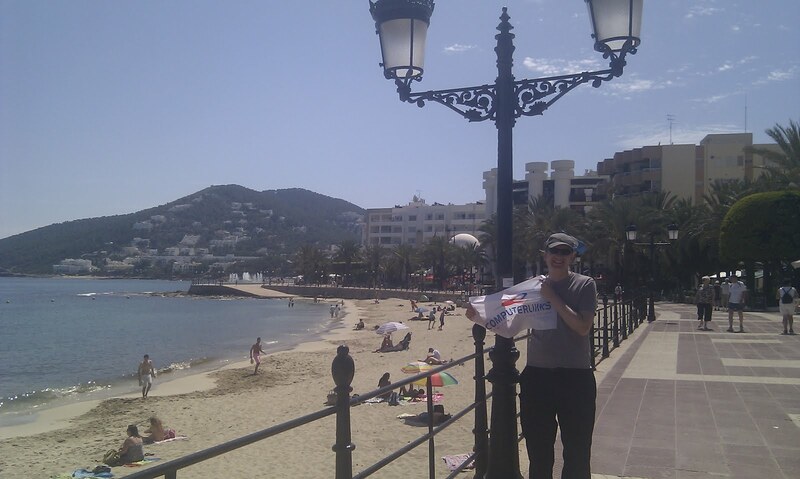 The beachfront promenade of Santa Eularia, with my company flag. For everyone that goes on holiday and takes a photo of themselves with the flag, they have a chance to win a prize at the end of the year. Another takeaway dinner from the complex bar, eaten outside, on our last evening. Dropping off the cars were no problem, and we easily checked in at the Thomsonfly desks. We then headed upstairs to security. There is a lift, but it is hidden almost behind the checkin desks, near the staff security checkpoint. By now we have flown with Matthew many times, indeed this was his 26th flight, so we have just about got down pat the security routine! One person, usually my wife, takes Matthew out of the pushchair, puts her bag on the belt and walks through, carrying Matthew. I put the rest of the bags on the belt, fold the pushchair and send through, taste the water / milk should it be required, and take laptop out and scan. Then once I come through Matthew should already be sat in his pushchair and we are ready to go. After completing security, we headed to the big windows, so Matthew could look at the aeroplanes. He can't yet say "aeroplane", or even "plane" properly, so he calls them "pele", pronounced like the footballer... After he got bored, we headed to an overpriced cafe for a drink. When the flight was called for boarding, we headed towards the gate, but as we got there we were at the end of a very long queue. 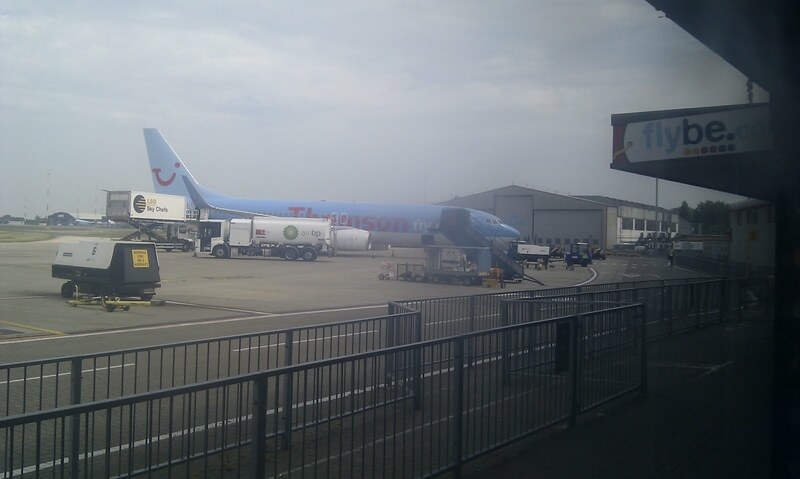 The next gate was for a Thomson flight to East Midlands, scheduled for 5 minutes after ours. When our queue started moving, several people must have realised their mistake. Their gate opened as well, and both queues continued past the desks, down the stairs and onto adjacent busses. After a short drive we arrived at our aircraft. On boarding, we were welcomed on board and we took our seats. It looked quite new, with mood lighting, and I later found that the aircraft was only delivered new from Boeing in February this year, 3 months ago. An announcenent was made that the flight was very lightly loaded today, approx 40%, but to remain in our allocated seats until after takeoff, when we could move. Interestingly, the allocated seats were the first few rows, then the last few rows, leaving the middle section empty - I would have assumed the reverse. Takeoff was rather leisurely, perhaps due to the light load, but we rapidly gained height. We turned to the north and continued climbing. Shortly after crossing the Spanish mainland coast, the cloud cover obscured our view, just after spotting the Circuit de Catalunya. When the fasten seat belts sign was turned off, plenty of people moved to empty rows, including my mum, who moved to the row immediately behind us. Just as on the outward journey, the BOB cart made its way first, before the pre-booked meals were handed out. This time, my wife's gluten free meal was loaded on board, perhaps as our rep Debbie had made a note and contacted Thomson head office in the UK to make sure it was available this time. The GF meal was a chicken curry with rice, and a GF bread roll. I was informed that it tasted good, though the roll was very hard and dry, but that it typical of GF bread. The regular meal was sausages and mash, and they were surprisingly good, for a re-heated sausage. Tea and coffee were brought round after. 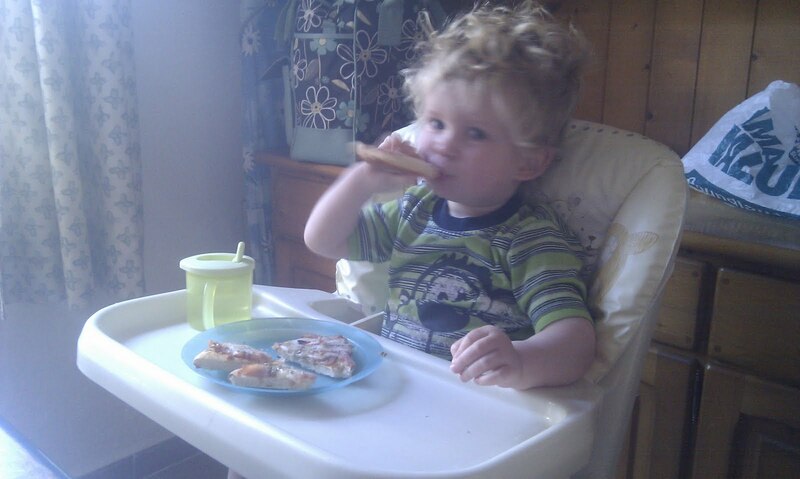 Matthew ate some crackers and marmite that we had brought for him, succeeding in covering his face and hands with the sticky brown spread. Our route took us over Limoges, Tours, Angers and Cherbourg. Over Normandy the clouds dispersed, and we could see the Channel Islands including Jersey and Guernsey quite clearly. The clouds returned over the English coast, but we crossed London, and followed the coast towards Norfolk. We descended through the clouds, just after we would have passed over the village that my Mum lives in, but she spotted the next village easily. It was now raining, with water streaming down the windows. We touched down on runway 27, and felt the braking as we were all thrown forwards, thanks to the short runway. Once speed was under control, continued to the end of the runway to turn around and backtrack to the taxiway to return to the apron. Stairs were brought, and we descended in our turn, we picked up the pushchair and walked over to the arrivals door and passport control - fortunately it had stopped raining by now. Our luggage didn't take long to arrive, and we exited the terminal, to take the last taxi left on the rank - it wasn't big enough for all of us, so my mum and sister waited for the next to arrive, after the driver radioed his comany to call for more taxis. After a quick 10 minute drive, we were back at home. Now I have no more flights booked until our trip to South Africa in November, for my brother-in-law's wedding. Sounds like a fairly relaxing family holiday. Hope Matthew doesn't get out of the travel habit between your trips. I can see you had a great time in Ibiza! When I want to go there I always search for Apartments in Ibiza town, they are one of the best options to stay in the island!